In 1853 Roger Wilmans discovered in the Royal Library in Berlin, a 14th century manuscript  originating in the former Norbertine Abbey of St. Peter in Brandenburg, a life of St. Norbert which was hitherto unknown. Three years later, in 1856, this Vita was published in the Monumenta Germaniae Historica series . Wilmans believed that this Vita which he discovered predated the Vita which was already known and which was published by the Bollandists in the Acta Sanctorum . He therefore named his discovery Vita A and called the previously known Life of St. Norbert Vita B. Until 1972, when a fragment of a manuscript in Hamburg was identified as a section of Vita A, Wilmans' discovery remained the only copy of this Life of St. Norbert and it remains to this day the only complete edition. The identification of the Hamburg fragment, however, informs us of the fact that there was at least one other copy of Vita A in existence. This fragment also dates from the 14th century. It is slightly damaged since it had been used for binding a book. The following translation is based upon the 1856 edition of Roger Wilmans as found in the Monumenta series. For information on Vita A and its interpretation, I have relied on the Introduction to the Vita Norberti A written by Father W. M. Grauwen, O. Praem. of Postel. This Introduction has been translated into English by Father O. Michael Meeusen, O. Praem. of Tongerlo. It contains the most recent and up-to-date material on the subject. Since the discovery of Vita A in 1853 there has been an ongoing dispute concerning its primacy over B and vice versa. Richard Rosenmund, in 1874, concluded that both A and B depended upon a lost vita which he called "alpha". Father Grauwen supports the primacy of A, arguing, among other things, that medieval authors added scripture citations and miracle stories rather than remove them. Vita B is a much longer text due to the multiplication of scripture quotes and moralizations. The length of B, however, does not imply additional factual data. From internal evidence Father Grauwen concludes that Vita A was written first and probably between 1145-1161/64. Vita B was most likely written between 1152-1161/64. The author, though internal evidence is not sufficient to attribute authorship to a definite person, was most likely a German who had taken part in the Rome expedition of 1132-1133 and therefore knew Norbert personally. As to his being a German, the author of Vita A, when speaking about the construction of the church at Prémontré in Chapter 12, speaks of competition between the German (Teutonici) and French (Gallici) workmen, whereas the author of Vita B refers to German (Teutonici) workmen and "our men" (nostrates). In Chapter 21, the detailed description of the approach to Rome and the sites of the encampments appears to be that of an eyewitness. At one time it was thought that there might be more than one author involved. Chapters 1-17 were originally believed to be written by a Frenchman from Prémontré, and Chapters 18-23 by a German from Magdeburg. In the one extant manuscript, Chapter 18 begins with a large illustrated letter A. Perhaps this is because the 14th century scribe rightly sensed that there was an important break in the narrative. However, by comparison of the style and vocabulary used in both parts we can safely accept single authorship. Vita A is much shorter than B. Vita A, whose title is "The Life of Lord Norbert, Archbishop of Magdeburg", was most likely intended to be a biography stressing the virtues of the author's hero. Probably Vita A stems from Magdeburg or some place close by. Vita B, it seems, may have been intended as a history of the Order beginning with the life of the founder. The continuation or second part was either never written or was lost. Its title as found in the earliest manuscripts is "Concerning the Origins and Spread of the Praemonstratensians". Vita A is a rather concise text of a relatively high density of historical facts. Vita B is more hagiographic and moralizing than Vita A and for this reason perhaps more adapted to monastic listeners and readers. Possibly this is the reason for the survival of twenty-five copies of Vita B as opposed to the single known copy of Vita A. The Chapter divisions were added by Wilmans when he edited Vita A. The Chapter titles are the translator's addition intended, as possibly Wilmans' divisions were, to break up what would otherwise be one solid unit of text. I have tried to give an accurate translation of the Latin while allowing for a readable English text. On a number of occasions I have added the name "Norbert" either for clarification or to avoid the monotony of reading "he" or "him". Sometimes the author refers to Norbert merely as "the priest", "the man of God", "the servant of God", etc. The devil is frequently referred to as "the old enemy" or "the evil enemy". Nothing has been left out due to tedious repetition. Thus the complete text of Vita A is represented here. I would like to thank Abbots John E. Neitzel and Jerome G. Tremel as well as Fathers Hubert N. Beaudoin and Joseph P. McLaughlin who were generous enough to take the time to read this translation and offer suggestions before it went to print. --Theodore J. Antry, O. Praem. In the year of the Lord's Incarnation 1115, when Pope Paschal II held the reins of the Catholic Church and Henry the Younger was Emperor, Norbert, of Frankish and Salic German stock, was a man well known in the town of Xanten. He was a cleric, a subdeacon, and was already middle aged. He was gifted by nature, handsome and well-proportioned. He was eloquent, well educated, refined and pleasant to all who knew him. His father was Herbert from the Castle of Gennep, near the forest of Ketela. His mother was Hedwig. They had decided that he would be a cleric since, because of a revelation received in a dream, they expected great things of him. While Norbert was at the imperial court and at the church in Cologne he was held in great esteem. He enjoyed the affluence and the conveniences of temporal life to his heart's desire and lived with no fear of God. Now when he had possessed all these things in abundance for a long time, it happened one day that he was hastening secretly to a place called Freden. He was dressed in silk, accompanied by a single servant. While on the way a dark cloud overtook him, lightning flashed, thunder roared, and much more inconvenient, there was no house for shelter nearby. Whole both he and his companion were unnerved, suddenly the terrifying sound and sight of a thunderbolt struck the ground opening it to the depth of a man's height. From here steamed forth a putrid stench which fouled him and his garments. Struck from his horse he thought he heard a voice denouncing him. Returning to his senses and now repentant he reflected on the words of the Psalmist: "Turn from evil and do good." Thus motivated, he returned home. Back home, caught up in the spirit of salvation through fear of the Lord he put on a hair shirt beneath his outer garments intending to do good deeds and penance for his past life. 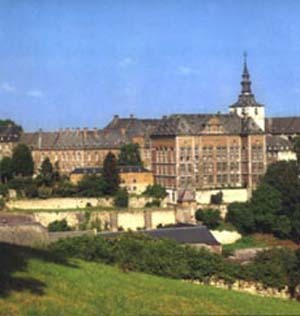 He went to the monastery of Siegburg and there enjoyed the holy company of Abbot Conon under whose teaching and good guidance he advanced in fear and love of the Lord. When the Ember Days approached, days set aside by church custom for ordination to sacred orders, Norbert, still a subdeacon, presented himself to Frederick Archbishop of Cologne. He requested that he be ordained a deacon and priest on the same day. Since this was forbidden by canon law, the archbishop asked him the reason for this sudden and unexpected desire. Norbert, after being pressed for an answer, fell at the archbishop's feet and with tearful groans expressed sorrow for his sins. Asking pardon, he protested to the archbishop his firm and unbending decision to change his life. The archbishop, after much deliberation and considering the outcome, although it was altogether contrary to reason and customer to ordain someone to diaconate and priesthood at the same time without knowing the reasons, nevertheless, granted the dispensation and assented to his request. When the time for the ordination was at hand, Norbert, about to put on the sacred vestments, changed his secular garb and clothed himself with garments that seemed more suited to religious life. Then, putting on the sacred vestments he was ordained first a deacon and then a priest on the same day. His desire fulfilled, Norbert returned to the Abbey of Siegburg and there spent forty days in the service of God and the exercise of his priestly duties. He then returned to the church at Xanten. Taking his turn celebrating the sacred mysteries of the Mass, he preached a word of exhortation to the people who were present. The following day in the chapter hall, without holding back, he admonished his fellow canons regarding salvation. Patiently and wisely he denounced, entreated and reproached them. However due to his persistence, he became bothersome to some. He endured their derision and many insults, among which, a man of low station even spat in his face. After this insult he restrained himself and kept quiet. He wiped his face and, remembering his sins, preferred to give in to his tears before God rather than retaliate. At a later date, worn out with fasting and vigils, Norbert celebrated Mass in a crypt. After the Lord's Body and Blood had been consecrated, a large spider fell into the chalice. When the priest saw it he was shocked. Life and death hovered before his eyes. But lest the sacrifice suffer any loss he chose rather to undergo the danger and consumed whatever was in the chalice. When the service was finished, believing he was going to die, he remained before the altar and commended his awaited end to the Lord in prayer. Then he was disturbed by an itching in his nose. He scratched it, and soon the spider was expelled by a sudden fit of sneezing. Through this event both his faith in God and God's goodness to him became evident. Norbert made daily progress towards perfection. At one time he would visit the monastery of Siegburg, at another time Rolduc, a church of regular clerics. But often he went to a hermit named Ludolph. This was a man of great holiness and temperance living the life of a cleric; this man was a lover of poverty and a fearless advocate of the truth. He was well known at that time, enduring untold threats and violence against himself and his brothers. These things were directed against them by perverse priests and clerics whom he used to admonish for their wickedness. Further, Norbert carefully inquired into the life and customs of anyone living under a rule - monks, hermits, and recluses - and by their example he made even greater progress. 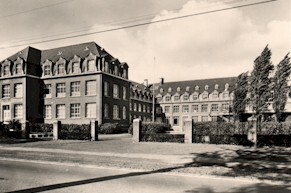 Norbert then returned home and remained for two years in a suburb of Xanten at a church which was part of his property and which was located on a mountain called Fürstenberg. He lived here as a solitary spending his time in prayer, reading and meditation. Through fasting and vigils he chastised his body and daily offered a rich sacrifice on the sacred altar. He spent many nights without sleep. He said that the practice of night vigils was fruitful although it left the body tired and open to temptation. Thus while he kept watch one night he prayed for direction from God to help him in planning the future. Growing weak and drowsy, he supported his chin with his hand. Suddenly he heard the old enemy shouting insults: "Ha, Ha! How do you expect to accomplish the many things you propose if you cannot persevere in the intention of one night?" To this the priest responded: "Who believes your threats since, from the beginning, on the testimony of Truth itself, you are a liar and the father of lies!" At this the evil spirit fled confused. While Norbert, amidst these events and other such, was subject to the derision of many, he attended a Council which Conon, legate of the Apostolic See, was holding in the church at Fritzlar with the archbishops, bishops, abbots, and many of the clergy and Christian people. Here, accusations were made against him by some envious people. They wanted to know why he had usurped the office of preacher and why was he wearing a religious habit although he was still living on his own and hadn't entered religious life; why was he wearing sheep or goat skins while still in the world. He responded: "If I am attacked concerning my preaching, it is written: 'If someone turns a sinner from the error of his way, he will save his soul from death and cover a multitude of sins.' However, the power to preach is given to us at the reception of the priesthood when it is said: 'Receive the power to proclaim the Word of God.' If I am questioned about religious life, religion, pure and undefiled before God and the Father is this: 'to visit widows and orphans in their tribulation and to keep oneself pure from this world.' Finally, if it is a question of clothing, the first shepherd of the church teaches us that acceptability before God is not found in precious garments. Hence we read that John the Baptist was dressed in camel hair and St. Cecilia wore a hairshirt next to her skin. At the beginning of the world the Creator made and gave to Adam not a purple garment but a tunic of skin." Having said this in his own defense, he departed and after the third year of his ordination, seeing that he did not benefit the men of that region either in word or in deed, decided to set out for another country. 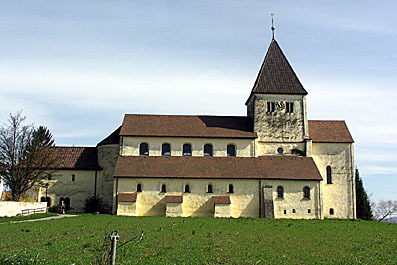 He gave and confirmed the above mentioned church at Fürstenberg to the Monastery of Siegburg, establishing that there would always be monks there serving God. He then resigned whatever benefices and income he held from the hands of Archbishop Frederick of Cologne. Moreover, he sold his houses and whatever else he possessed, either through patrimony or in some other way by hereditary right, along with their furnishings, and gave the money to the poor. He kept for himself only his priestly vestments and a small amount of silver, about ten marks in value. Then with two companions he set out on his pilgrimage in the name of the Lord. When he had arrived at Castle Huy located along the River Meuse, he distributed the above mentioned silver to the poor. Leaving behind all his temporal possessions, and clad only in a woolen tunic and mantle, barefoot and with his two companions, Norbert set out for St. Gilles through the bitter winter. There he found Pope Gelasius, successor to Pope Paschal. Upon request he received pardon for the canonical offense committed when he received the two sacred orders at the same time. When the Pope saw that Norbert was a prudent man and filled with zeal for God, he tried to keep him with him. But Norbert humbly explained his plans to the Pope and received permission to leave. He also received open permission to preach anywhere which the Pope confirmed in writing. 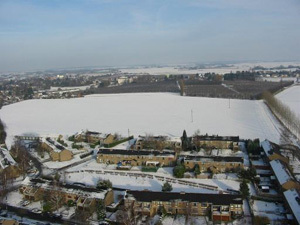 After receiving the apostolic mandate to preach, leaving St. Gilles he came to Orleans, trodding barefoot through the cold ice, deep snow up to his knees. Here he added to his company a subdeacon. And now with three companions he came to Valenciennes on Saturday before Palm Sunday. The next day he preached to the people who favorably received him. But when asked to stay there and rest, Norbert was detained against his will since his companions were suddenly seized by illness and he had to take care of them. Soon, however, within the Octave of Easter in that same city they fell asleep in the Lord. 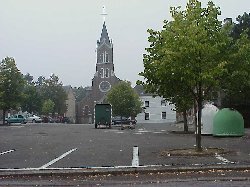 The two laymen were buried in a suburb of Valenciennes in the Church of St. Peter near the market on the left toward the west; the subdeacon who had become a monk was buried in the Church of the Blessed Mary located in the same town. On the Wednesday before Holy Thursday, Burchard, Bishop of Cambrai and an honorable man, was passing through Valenciennes. Norbert who had known him previously went to see him. 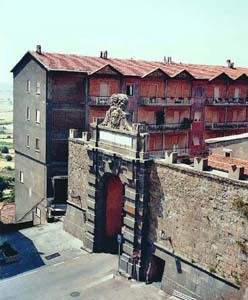 Arriving at the gate of the house where the bishop was staying, a cleric admitted him to a room and after some conversation the bishop recognized Norbert. The bishop, looking at him standing there with bare frozen feet and dressed in rough clothing, absolutely amazed and dumbfounded, fell upon his neck with a gasp and cried out: "Oh Norbert, who would ever have believed or even thought this of you!" The cleric who had admitted Norbert wondered about the bishop's affection for him and asked the reason. The bishop answered: "This man whom you see was brought up with me in the court of the king, a man noble and abounding in delights to such a degree that he refused my bishopric when it was offered to him." Hearing this, the cleric filled up with tears both because he saw his master weeping, but also because he longed for a similar way of life. Secretly he checked out where Norbert would be continuing his journey. Norbert was suddenly seized by a serious illness while still in the city. The bishop kindly tended his illness, daily visiting him through the members of his court. The aforementioned cleric was among those visitors and when Norbert grew stronger he approached him and promised to accompany him in his profession and journey. Norbert thanked God thinking that the man was going to set out with him. But when the cleric stated that he first wanted to set his affairs in order, Norbert was troubled at his words and said only: "Ah, brother, if this is of God, it will not be undone." The cleric left promising to return and, disposing of his possessions, a little later did return henceforth to follow the man of God. The name of that cleric was Hugh. Enjoying Hugh's company, Norbert went with him about the castles, villages and towns preaching and reconciling those at odds with one another and reducing old hatreds and wars to peace. He sought nothing from anyone, but if anything was offered he distributed it to the poor and lepers. He trusted in the grace of God that he would have the necessities of life. Considering himself a stranger and guest on the earth, no trace of ambition could touch him; his entire hope was on heaven. He could not understand that someone could despise everything for Christ and yet use his ability to work for contemptible and abject rewards. He inspired such love and admiration by his presence that wherever he went, accompanied by his one companion, as he was drawing near the villages and towns, shepherds would leave their flocks and go running before him to announce his arrival to the people. People flocked to him in droves and during Mass heard words of exhortation from him about doing penance or about the hope of eternal salvation promised to everyone who calls on the Lord's name. They took pleasure in his very presence and considered themselves fortunate if they could receive him into their homes. People were amazed at this new style of life, namely to live on earth and seek nothing from the earth. According to the gospel mandate he carried with him neither purse nor sandals nor two tunics and was content with only a few books and vestments for Mass. His customary drink was water except when he was the guest of religious persons. Then he followed their practice for a time. Frequently, when he was asked to give a word of exhortation, among those who were eager to learn were others who would test him and mock him in order to impede his sermon. But in his simplicity, ignoring their abuse, he never ceased to perform the work of God eagerly. He practiced fasting and vigils, was diligent in work, pleasing in word, pleasant to see, kind toward simple people, stern against the enemies of the Church, so much so that he gained the favor of all people. One day when Norbert was passing through the village of Fosse here occurred a gathering of clergy and laity who admired his unusual way of life, especially since they knew his companion. Understanding that he was a minister of peace and concord, they eagerly requested that he remain with them a while, explaining that there was a feud of mortal hatred in their region which could be settled neither by nobleman nor churchman. Because of this nearly sixty men had been killed. Now, by the grace of God, even while they were making their request, a man came along whose brother had been killed that very week due to this hatred. when they saw him they said: "Look, here's one of those about whom we've been speaking." Calling the man over, Norbert embraced him, saying: "My dear man, I am a stranger just passing through, but I ask a favor of you. Grant pardon to those who killed your brother and receive your reward from God." Immediately tears came to the man's eyes. Not only did he grant pardon but submitted himself to the man of God giving him the opportunity to reconcile other enemies and bring about peace completely. On the following Saturday, when members of both sides of the dispute assembled at the town of Moustier, many other people came, partly to see the man of God and partly to be present for the hoped for reconciliation. Norbert remained praying in his room with the door closed until almost the third hour. When Norbert's companion politely informed him that the people were becoming restless, he responded that God must be served, not according to the will of men, but according to the will of God. But soon he came out after first devoutly celebrating the Mass of the Blessed Virgin Mary and then a Mass for those who had died due to the feud. Afterwards he preached to those who had at first drifted away but had regathered. He began: "Brothers, when our Lord Jesus Christ sent his disciples out to preach, among other things he gave them the command that whatever house they entered they should first say: 'Peace be to this house.' And if a son of peace was there, their peace would rest upon him. Now we, who have become imitators of them, not by our own merits but through the superabundant grace of God, announce that same peace to you. Do not let your unbelieving minds disregard this peace because it touches on everlasting peace. You are not unaware of why we have gathered. Its accomplishment is not mine nor of my doing, since I am a stranger and traveller, but it is of the will and power of God. It is for you, however, to comply with His will with complete and total affection." To this they responded with one voice: "Let the Lord, through you, command whatever is pleasing to Him. We should not contradict whatever the Lord wants us to do." What more is to be said? Both sides of the dispute went out into the courtyard and, with relics placed in the space between them, they abjured their discord and made peace, confirming it by oath. Very early the next day Norbert left this place and set out for another village called Gembloux, not far distant, to deliver a sermon to the people there. He was very well received because the people heard that he was a bearer of the Word of God and a bringer of desired peace. In this region also two princes had almost reduced everything to a wasteland with their incessant fighting, plundering and burning. When the man of God heard this, moved by the cry of the people and taking pity on their destitution, he went to these leaders, first to the one, then to the other. He addressed the first man in these words: "You are great and powerful and you should be aware that your power has been granted you by God. Thus you should listen to me his servant not out of respect for me but out of respect for Him. I have been sent to you for your benefit and that of many. Therefore, listen to a poor traveler; receive the commands of the Lord your God which are passed on to you so that you may be received by Him. Forgive the one who has offended you so that you may be forgiven and thus the consolation of the poor and needy might bring about the remission of your sins." After hearing this, the prince, taking into consideration the man's poor clothing, his modest expression and the quality of his speech, became submissive and said: "As you wish. It doesn't make sense to contradict this request of yours." Accomplishing what he desired with this man, he went to the other whose heart was hardened. From the grimness of his face and the harshness of his words Norbert knew that this was not a son of peace. Refraining from his planned speech, he said to the brother who was with him: "The man is insane, but he will soon fall and be captured and trampled down by his enemies." He said this and departed. Norbert's prediction was fulfilled within the week, for the prince was captured and put in prison. Next Norbert cane to the nearby village of Couroy, and because his reputation had spread in all directions, people from that vicinity came out to him. After the celebration of Mass he spoke about peace and concord as was his custom. He began , with humble exhortation, to recall some who were at odds with one another due to their old quarrels. In spite of the request, one of them, unwilling to make peace, got up and ran outside, and jumped on his horse, attempting to flee. But the horse, although vigorously jabbed with spurs, would not move. At this the crowd gathered, some out of curiosity, some to mock, some weeping. The man himself, shaken, returned to the church and, prostrate, asked pardon. He agreed to the condition of peace to which he had been previously urged and received absolution for having offended the man of God. In that same year the blessed Pope Gelasius, from whom he had received permission to preach, departed this world. He was succeeded by Callistus, the Bishop of Vienne, a man of pious and holy life and worthy of memory. He was unanimously elected at Cluny and was elevated to the highest honor, dignity and power in the See of the Universal Church. The aforementioned Gelasius, along with the more sensible Cardinals, had traveled in order to visit Holy Mother Church in her members. He had heard much about the Church while presiding as its head - he had been chancellor for many years during the reign of Pope Paschal and others - and whatever went on in the world could not be concealed from him. Therefore Callistus, the successor of Gelasius, held a Council at Rheims where he both confirmed his own election and strengthened the state of the Church. He approved what was right and corrected what was wrong and authorized these corrections by the power of Rome. When Norbert heard that the dignity of the Apostolic See had been passed on to another, he came to this Council barefoot in the fall of the year. He was joyfully received by the bishops and abbots who had gathered there. These asked him to ease up a little the harshness of the penance he had undertaken, but he refused to give in. While meeting with the Pope regarding his status he requested that the letter of Apostolic authority which he had received from his predecessor Gelasius, as mentioned above, be renewed. This was granted. The Pope then asked Bishop Bartholomew of Laon to look after him. There were in the diocese and even in that city some close relatives on his mother's side who were concerned about him, and, due to their influence, the bishop was advised to administer a gentle hand to him for a time even though it was unwanted. When the Council was finished, the man of God, Norbert, decided to spend the winter at Laon for he was alone and left without the comfort of companions. Until now Hugh had been his companion around his home territory, viz. around Fosse. He had not yet changed his secular garb for religious garb but traveled with Norbert through places he knew to put his affairs in order. After the Council he left his companion and master Norbert to himself, returning to Cambrai with his bishop, Burchard; he did not return for two years. 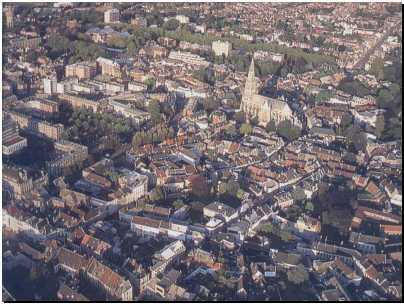 At that time there flourished at Laon the school of Master Anselm and his brother Rudolf. The man of God decided to attend their lectures on the psalm Beati immaculati. Drogo, a religious man and at the time prior of the Church of Blessed Nicasius at Rheims, heard about this. Norbert and he had been acquaintances and companions in school. Drogo angrily wrote to him: "What is this I hear about you? You were brought up and educated in the school of the Holy Spirit Who is not slow in teaching; do you now leave that school and attend a secular school? Divine Wisdom espoused you; now worldly philosophy has loved and allured you. Perhaps you say: 'Through the one to the other; I intend to reach wisdom through knowledge.' To which I say: 'The structure of your building was not begun in such a way that Rachel would follow Leah'. For the Holy Spirit, Who made a harpist and, without the help of a grammar teacher, suddenly made a psalmist out of a sheepherder, has taken you from the emptiness of the world and suddenly made you an evangelist.' Therefore, my dear friend, hear me as your prophet and know that if you wish to hold to both, without a doubt you will lose both. It is not so bad or even human for a man to sin, but to act against the Holy Spirit is serious." What more? A word to the wise is sufficient. Norbert immediately withdrew, coming to his senses and turning to Him about Whom the Lord promises: "He will teach you all truth." Not long after this the Pope came to Laon. The Bishop, taking counsel with the Pope on how to keep Norbert in Laon, urged the Canons of the Church of St. Martin in the suburb of Laon to elect Norbert as their abbot. The canons petitioned both the Bishop and the Pope for Norbert. When asked and forced to respond Norbert answered the Pope humbly: "Reverend Father, do you not recall the duty and the labor of preaching the word of God to which I have been appointed twice now, both by your predecessor of happy memory and also by you? But lest I give the impression that I refuse to submit to authority, I assent to your wish, except, of course, for my intention. I am in no way able to alter my intention without grave detriment to my soul. My intention is this: not to seek what belongs to another; in no way to demand back through secular justice or legal process what has been stolen; not to entangle anyone in the bonds of anathema for any injuries or loss suffered; but, to sum up briefly, I have chosen to live simply the evangelical and apostolic life rightly understood. Nevertheless if the canons living in this church are not afraid to hold to this form of life, I do not refuse the burden." But when the evangelical institution was explained to the Canons of St. Martin, viz. how they were to be imitators of Christ, how they would have to despise the world and be voluntarily poor, how they would have to bear up under reproach and insult and derision and suffer hunger, thirst and nakedness and other things of this sort, how they would have to be obedient to the precepts and rules of the Holy Fathers, they were immediately terrified by his words and appearance and said: "We don't want this man over us because neither our custom nor that of our predecessors has known such a master. What is ours would be taken away and not returned, we would plead our case and not benefit, we would pass sentence but not be feared. Let us live as we are. God wants to chastise not kill." Thus Norbert obeyed and, since he was released from his obedience, did not disobey. Meanwhile the bishop was trying to nourish his enfeebled guest, thin from cold and fasting, but he was daily nourished by his guest through the spiritual sharing of the honey-sweet word of God. For this reason he grew very fond of Norbert and urged him with all sorts of arguments to remain in his diocese. Daily he took him around and showed him places in the hope that there might be a church he liked, or some lonely place, some wilderness, some cultivated or uncultivated spot on which to build or remain. Finally, overcome by the bishop's pleas and those of many others, both religious and noble, he chose a place extremely deserted and lonely which from of old was called Prémontré by the inhabitants. Here he pledged to remain if God would allow him to gather companions. When winter had passed, he went forth to preach. He came to Cambrai where he attracted a young disciple by the name of Evermode, a man after his own heart. Norbert's spirit so rested in him that he confided to Evermode where he wanted to be buried after he died and ordered that he should never leave him without returning. After him Norbert attracted other disciples who were to be the root and foundation of a future multitude that followed this man of God. But the snares of the old enemy were not lacking to the beginnings of this holy profession. Observing in each one of his individual behavior - in one, namely the love of contemplation, in another the desire for wisdom, in still another the intention to fast - Satan tried to impede each one. Thus it happened one night that the old adversary came to a certain man at Matins as he stood and contemplated the glorious and ineffable Trinity and said: "How happy you are, how praiseworthy in your intention. You have begun well and think you will perservere under affliction. Therefore you deserve to see the Holy Trinity to which you aspire with all your heart." 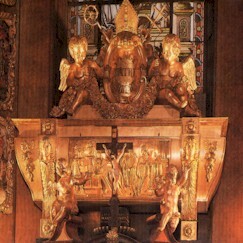 Saying this he appeared with three heads claiming to be the Trinity. The man was frightened, but hesitated a moment, for out of this vision came a foul odor. The man said: "O wretched, unfortunate and most pitied of all creatures! You who were the image of God's likeness and through pride lost the knowledge of this truth, how do you presume not only that you know the Trinity, but that you are the Trinity? You did not even have the strength to want to know yourself. Depart, and don't disturb me further since I am not obedient to your deceits." Satan departed immediately, only to return to this man later. This confrere was indeed prompt to obey, devout in prayer, assiduous in fasting, so much so that he fasted the whole year both summer and winter and no one could persuade him to take a second meal during the day except on Sundays and even then food that was raw and uncooked. But while everyone was amazed at him, and his great abstinence and mortification in praise of God was spoken of everywhere, Satan was present again secretly setting snares to destroy the new soldier. He was a youth and Satan found it an insult that he had already resisted him. Therefore on Ash Wednesday when the Lenten fast is imposed on all the faithful, such hunger and voracious gluttony seized the man that he said he could not fast and undoubtedly would die if he were even forced to abstain from milk and cheese. When he was told: "It is not permitted anyone, even lay people, to eat twice; not even little children are permitted milk and cheese", he answered with grim face and wolfish fury: "Does God want a man to die by withdrawing from him at the hour of his need to eat what he created for his use?" Finally, the confreres allowed him to eat lenten food twice or even more often if only he would abstain from milk and cheese. When Lent was over Norbert returned to his confreres. But as he approached he shuddered and felt a strong wind surround him. He told those with him that evil was present. When he heard what had happened, with great sadness, he ordered the man to be brought to him. When the man was brought in he was scarcely able to stand he was so fat. And he was so filled with the spirit of gluttony that he could only cast a grim look at his master, whom he had previously loved with a special affection. The man of God, however, seeing that this was not a human infirmity, but something diabolical that had overcome him, forbade that any food at all be given to him. After he had fasted for some days, he considered it a delight when a quarter part of rough bread and a cup of water were given to him. And thus with the help of God he was restored to his former way of life. Some time later Norbert set out to restore peace to some who were at odds with one another. Taking along Hugh, his first companion, who had been absent for some time, he arrived with him at Nivelles. There were some in this city who formerly had come to Norbert for the sake of conversion and later went away unable to bear the austerity of his life-style and rule. To insult him they did not come to see him or listen to his preaching. Moreover, they tried to turn the people away from him. But their malice was very quickly brought to naught. By the Providence of God one of the citizens, having a daughter who had been possessed a whole year by a devil, with weeping and sighing brought her to the man of God to be cured. Taking pity on his sorrow, the servant of God, vested in alb and stole, read an exorcism over the girl who was then twelve years old. When he was reading the gospel over her head, the demon mockingly responded: "I have frequently heard tunes of this sort. Neither for you nor for all of these people will I leave this house. For whom should I depart? The pillars of the Church have collapsed." But when the priest increased the exorcisms, the demon again responded: "You accomplish nothing, because you have not yet commanded me through the glittering blood of the martyrs." And soon the demon, flaunting his knowledge, recited, through the mouth of the girl, the Canticle of Canticles from beginning to end. Then, repeating word for word, he translated the same Canticle of Canticles into French. Once again he proclaimed the whole thing word for word in German through the mouth of the girl who, while she was well, knew nothing but the Psalter. However, at the insistence of the priest that he depart from the creature of God, the demon said: "If you cast me out, permit me to enter a monk who is here present." He named the man. But Norbert exclaimed to the people: "Listen to the evil of this demon who, in order to shame a servant of God, seeks to trouble him as though he were a sinner and worthy of this punishment. But don't be scandalized because such is his wickedness that he wishes to revile all good people and as much as possible make them disreputable. : Having said this Norbert pressed on more intently with what he'd begun. Then the demon said: "What are you doing? I won't leave today either for you or for any other. But if you hear me cry out, many of my forces, the forces of darkness will come to battle. Ha Ha! To battle! Ha Ha! Now I will bring these arches and vaults down on you." At these words the people scattered but the priest remained calm. Then the girl grabbed his stole in order to choke him. When those present wanted to remove her hands he said: "Don't! Let her. If she has received the power from God, let her do what she can." When she heard this she released him on her own. Now since a good part of the day was gone, Father Norbert thought that the girl should be placed in holy water. This was done. And because she was a charming girl with blonde hair, the priest, fearing that the devil would use her hair to keep her in his power, ordered her hair to be cut off. The demon, agitated by this outrage, attacked the priest with curses and said: "Stranger from France, stranger from France, what have I done to you? Why don't you allow me to rest? Every evil, every mishap and every misfortune will come upon you because you vex me without cause." It was now evening. And Father Norbert, seeing that the demon had not left, was somewhat saddened. He ordered her to be returned to her father and to be brought to Mass the next day. He began to remove his alb and other Mass vestments. When the demon saw this he shouted in insult: "Ha ha ha! Now you're doing well and you have not yet done to me the work that God has approved. You've spent the whole day in vain." But Father Norbert, returning to his lodging, decided not to eat until the girl was healed and thus he passed that day and night without food. When the next day dawned, the priest of God prepared to celebrate Mass. The girl was brought and a great crowd of people gathered, coming to await the outcome. Norbert instructed two of the confreres to hold the girl close to the altar. After the Mass had begun and the gospel was being read over her head, the demon responded mockingly that he had frequently heard tunes of this sort. Soon, within the action of the Mass, the priest elevated the host; the demon exclaimed: "Look, look, behold he holds his little God in his hands." Demons confess what heretics deny. But then the priest of God shuddered and, taking on the Spirit of Truth in his very speech, began more intently to act against the demon. But the latter, being constrained, shouted out: "Behold I'm burning, I'm burning, behold I'm dying, I'm dying!" And again: "I want to leave, I want to leave, let me go!" And while the confreres were firmly holding the girl, the unclean spirit fled leaving behind the repulsive traces of very foul smelling urine. He left behind the vessel which he had possessed. The girl, freed from her tormentor, collapsed, and was carried faint to the home of her father. A little later, after taking food, she appeared completely sound, in control of herself, and perfectly healed. This took place publicly and the people witnessed it. Together they proclaimed the praise of God and acknowledged Norbert a truly apostolic man in contrast to those who had previously detracted him. Once Norbert was staying at Laon, intending to spend the winter with some of his powerful relatives whom he had met there, to take instructions in French, which he did not know. A pious woman from the town of Soisson heard of the reputation of the man of God. Wishing to speak with him, she secretly came to Laon on the pretext of visiting the shrines of the saints. After she had heard him preach the Word of God, she complained to him tearfully that she had for a long time remained sterile with her husband. She preferred, if it could be done, to be separated from her husband rather than be bound by legal or conjugal bond without the offspring that they had hoped for. The priest said to her: "It shall not be so, but very soon you will have a son. You shall not keep him as an heir for the world but you will soon dedicate your child to the Lord. After him you will bear several others with whom you will later take yourself and your possessions to the cloister to serve God." She believed him and was not disappointed. She bore a son. She called him Nicholas because she had obtained her promise around the feast of St. Nicholas. The child grew and was weaned. Meanwhile a council was held in which a decree was promulgated that the Masses of priests who had wives should not be attended. Hence occasion for heresies arose to such a degree that many believed and claimed that married priests did not confect the Body of the Lord on the altar. One day this same lady, whose name was Helwig, accompanied by her sister, went around to the shrines of the saints to pray. The boy, now in his fifth year, was with her. They entered a church, not to hear Mass, but just to pray. A married priest was standing at the altar celebrating Holy Mass. O inestimable and ineffable grace of God's goodness! While the mother was praying with tears streaming down her face, the eyes of her child lay open to the divine mysteries. The boy was standing between his mother and aunt and looking at the priest. Although he could as yet not speak well, he cried out clearly, saying: "Mother, mother, look at the boy, more beautiful than the sun, whom the priest at the altar is holding, adoring as God." The mother rose from her prayer and, wondering what it was, asked the child: "Son, is that the boy hanging on the cross whom you see?" She thought he was looking at the wood of the cross. "Not at all," he said. "The priest was holding in his hands a boy of wondrous beauty whom he's now covering, wrapping him in a cloth." The mother and her sister looked and they saw the priest covering with a corporal the chalice with the Lord's body. A threefold lesson is derived from this miracle: the uncertainty of the incredulous is removed; the faith of the pious is strengthened; the faithful, for whom this event took place, are edified by this divine revelation. From that day until the day of his death the boy Nicholas always suffered from weak eyesight. Nevertheless he lived until the promise of Norbert, the man of God, was fulfilled, and his father and mother, with property and offspring and a great number of relatives, entered the cloister and sent him as a deacon to the Lord. Father Norbert came then to Cologne and was welcomed with joy by the people who flocked to hear him preach and confess to him. They knew him previously as a youth and now they saw him wondrously changed. Many, on hearing his words, followed him then and there and became imitators of the poverty of Christ. At that time he wanted to build a church in which he could receive those he brought together. For this reason he petitioned Archbishop Frederick and other prominent men to see if he could take some holy relics for patron saints. 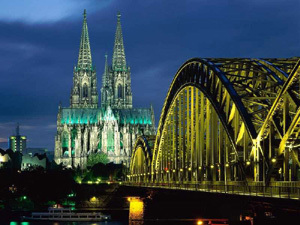 From ancient times the holy city of Cologne abounded with such relics. The bishop gave his consent; the clergy and people agreed, considering the man's request to be reasonable. Norbert imposed a fast on the confreres who were with him and commended this quest to God in the hope that He would let him find a venerable patron saint. That night there was revealed to one of these confreres in a vision a virgin, one of the eleven thousand virgins. The name of the virgin and the place of the mausoleum in which she was buried were also revealed. The next day, as pointed out in the vision, the body was sought and found complete in the place intended. This body was then taken up with hymns of thanks and praise. then two reliquaries were filled with the relics of the other virgins, the Holy Martyrs of the Theban Legion, the Holy Moors, as well as the two Ewalds. On the following day, he asked the Provost and the Canons of St. Gereon for relics. They gave him permission to look for them in their church and take them along with him. Norbert rejoiced and carefully commended this undertaking to God through the entire night as he was accustomed to do. When morning came he ordered them to dig in the middle of the monastery where there was no indication of a tomb. There a complete body without a head was found. The body had been buried with honor and great care. There was a valuable grave stone placed at the level of the ground, not deep, but covered by the thin marble of the pavement. The body was wrapped in green cloth which had been damaged by age. There was a large cross of gold embroidery resting on his chest over his robe. The body was dressed like a soldier with leggings and spurs. The head was cut off from the upper lip. Grass sod, which had been dampened by blood, lay between the body and the bottom of the sarcophagus. When the canons and the vast number of people who had gathered saw this, they said: "This is our master and venerable patron, St. Gereon, who has been sought for many years both by us and our predecessors but could not be found because of our sins." Shouting out joyfully in a loud voice they gave thanks to God and extolled this worthy man to God through whom so great and so long desired a treasure deserved to be found. No on should doubt that it was St. Gereon. The evidence of his identity lay in the fact that the narrative of his death and martyrdom records that part and not all of his head was cut off. 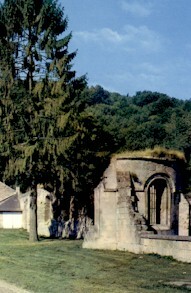 It was known that the head had been thrown by the pagans into a well which was between the sanctuary and the nave of the church. 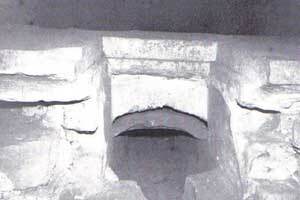 Over the mouth of the well an altar was dedicated in his honor but they didn't know where the rest of the body was. Therefore the holy body was properly exhumed. Part was given to the man of God but the rest was solemnly reinterred by the clergy and people. Not long after, taking up the relics and gathering the confreres, both lay and cleric, whom he had begotten for God through his preaching, Norbert set out on his return trip. Everywhere congregations honorably welcomed him in their churches. A certain noblewoman by the name of Ermesindis, the Countess of Namur, hearing that Norbert was passing through, quickly hastened to meet him and eagerly requested that he accept a church in the village of Floreffe and there install members of his religious community. For some time she had desired to establish a religious community in that church for the salvation of her own soul and those of her forebears. Norbert considered the loving devotion of the woman and undertook what she requested. Leaving behind one of the two reliquaries, Norbert hurried on to Prémontré because Christmas was close at hand. He had with him about thirty novices, both cleric and lay. Gathering these together with others whom he had earlier assembled, morning and evening he preached the saving word, encouraging them with comforting words not to fall away from their good intention and the voluntary poverty which they had undertaken. Whatever he taught them he demonstrated through his own works as an eagle calls its young to flight. His exhortations were not about the earth nor did they hold out anything earthly but, as a dove after taking wing, he flew to rest, and, for the most part caught up in ecstasy, made his hearers take flight after the example of the prophet, saying: "I shall take on wings as a dove and I shall fly and I shall rest." Some of those who followed Norbert believed that what they heard from him was sufficient for salvation and therefore they needed neither a rule nor structure of life. But Norbert, who was prudent and circumspect, lest his holy institute falter in the future and the foundation, which he intended to place on solid rock, totter, advised them that without a structure of life and without a rule and without the instructions of the Fathers, the apostolic and evangelical precepts could not be completely observed. The confreres, like sheep following their shepherd in simplicity, promised to obey him in all the things he proposed. Indeed many religious men, both bishops and abbots, had advised him in various ways, one suggesting the eremitic life, another that of an anchorite, still another to take up the lifestyle of the Cistercians. But Norbert, whose work and plans depended on heaven, entrusted his foundation neither to himself nor to others but rather to Him who is the beginning of all things. He pondered these many things in his heart but he and those who wished to live with him had been dedicated since their youth, Norbert ordered that the rule be accepted which the Blessed Augustine had established for his followers. The apostolic life which he had undertaken by his preaching he now hoped to live. He had heard that this way of life was ordained and renewed by this same blessed man after the apostles. By the profession of this rule then, on Christmas Day at Prémontré, one by one they voluntarily enrolled themselves into that city of blessed eternity. Afterwards individuals gave their own explanations and interpretations of this rule and their opinions were diverse. Because Norbert's writings and the works of other religious did not seem to agree, this led some to fear, some to doubt, others to be indifferent, inasmuch as the foundation was not yet well rooted. "Why are you surprised?" said the man of God, or "Why are you hesitant, since all the ways of the Lord are mercy and truth? Although diverse, are they contrary to one another? If the practice or the institution is changed, ought the bond of charity to be changed, which is love? Indeed the rule says: 'Let God be loved first, then neighbor.' The institute alone does not bring about the reign of God, but rather truth and the observance of the commands of God. Therefore the fact that this rule clearly binds in regard to love, work, abstinence from food, clothing, silence, obedience, regarding one another with respect and honoring one's father, what is there that would be of further use for any religious in order to obtain salvation? But if there should arise any contention regarding color or thickness or thinness of clothing, let them, who have the power to decide in this regard, make a decision. Let them show from the rule, from the institution of the gospel and apostles where whiteness and blackness or thinness or thickness is described and let the matter be settled. One thing is certain, however; the angels who were the witnesses of the resurrection are said to have appeared in white, and by the authority and practice of the Church, penitents wear wool. Likewise in the Old Testament, it was customary to go out among the people in woolen garments but, in the sanctuary, by precept, linen garments were in use. After the example of the angels it seems that white should be worn, and as a sign of penance woolen garments should be worn next to the skin. But in the sanctuary of God and during the divine services linen should be worn. Those who have gathered around Norbert from the beginning gave scarcely any care or concern for corporal things. Rather, they focused all their effort on spiritual things, on following the Sacred Scriptures and Christ as their leader. Father Norbert encouraged and assured them that those who wished to remain with him could never go wrong if they put into practice the profession they made according to the gospels, the words of the apostles and the rule of St. Augustine. Hence they were not ashamed of the poverty of their clothing, nor did they offer any difficulty in obedience; they kept perpetual silence in every place and at all times. When convicted of excesses, they fell to the ground to humble themselves. They avoided harsh glances and unkind words even toward delinquents. Norbert wanted his confreres to mortify the body with fasting, and restrain the spirit in humility. As mentioned before, he wanted his confreres to use woolen undergarments, and woolen garments for work; he wanted them always to wear linen breeches, although he himself wore rough haircloth. But in the sanctuary and wherever the Blessed Sacrament was to be handled or celebrated, he wanted them to use linen on account of cleanliness and respect. This last he decreed to be done at all times. Frequently he recommended the observance of three things, namely, cleanliness about the altar and the divine mysteries, correction of excesses and negligences in chapter and elsewhere, hospitality and care of the poor. At the altar, one exhibits faith and love of God; in the cleansing of one's conscience, care of oneself; in the reception of guests and the poor, love of neighbor. Indeed Norbert never ceased to insist that no house could ever suffer want beyond what it could bear if it carefully tended to these three things. One day he was returning from Rheims with some of his companions, and two novices whom he had attracted by his preaching of the Divine Word. As they were walking along the road in silence, reflecting on God, a voice from the clouds sounded in their ears: "This is the community of Brother Norbert." To which another voice on the side responded: "One of these novices is not in the community." Norbert, as well as the others, heard this. They considered the matter in silence suspecting nothing evil; nevertheless they were in doubt about what ought to be done. But Father Norbert, who was the most concerned, knew that it was not without purpose that God allowed these voices to be heard, and carefully sought in prayer the cause of this event. Meanwhile he considered the deeds and actions of those about whom the voices had been heard. When he considered that one of them was less devout in his confession, frivolous in his speech, restless in his behavior, inconstant in his practices, tepid in prayer, neglectful in obedience - he was an Englishman - he said: "What is it, brother, that you bear in your heart? Reveal what lies hidden. If you seek God, no creature is hidden from Him, because as the apostle says, everything is uncovered and open to His eyes. We seek the truth and, according as it is granted to human frailty, we strive to walk in the truth. There is no agreement of truth with falsehood, nor any participation of the faithful with the unfaithful. The man shook his head and answered flippantly. "Do you think, good Father, that I want to steal something from you? You are poor; but to everyone who has it will be given and in abundance. But from him who does not have even what he seems to have will be taken away from him." He said this and fulfilled his words by his action. At that time it happened that a man who had come to conversion had brought a little money along with what little he had. The money lay tucked behind the altar of the poor oratory which was all they had at the time. One night, the Englishman, foreseeing that the hour was suitable for him, fled with the money. Thus deceitfully he increased the poverty of the poor of Christ, who suspected nothing evil. As a result there was not enough for them to procure supplies for a day. After many confreres had joined Father Norbert, a permanent place of residence had to be prepared. The location was very rough and altogether uncultivated, set with brush and swamps and other inconveniences. There was no place suitable at hand for living except the little chapel and the orchard next to it as well as a small pond fed, as it is today, with water coming from the mountains when it rains and from the moisture of the swamps. While the man of God remained there with his companions in prayer awaiting the consolation of God, one of them received a clear and unmistakable revelation. He reported this vision to the man of God, namely that he had seen in a section of the property Our Lord Jesus Christ on a cross, and above Him seven rays of the sun shone with a marvelous brightness. A great multitude of pilgrims with their scrips and staffs hastened from the four corners of the earth and, after adoring their redeemer on bended knee and kissing his feet, they returned home. When he heard this the man of God gave thanks to the Lord. Later he called Bartholomew, Bishop of Laon, to come and consecrate the foundation which had been dug and to consecrate the stones which were the beginnings of the church. Among those present were Thomas, Lord of Coucy, who, for the sake of God, feared and respected Norbert. Also present were his son Engelrand still a boy, many nobles, clergy and laity, and a large multitude of people who wondered and spoke among themselves saying: "Who do you think this man is or of what faith that he doesn't use reason? Do you think this work is sound which is placed in such a wilderness and the foundation of which is not laid on rock or solid ground but in a swamp?" Such was the swamp that it could scarcely be absorbed even when a mass of rocks was thrown in. Nevertheless this foundation ought not totter nor be uprooted because a foundation which the Heavenly Father establishes will not be uprooted. Some of the stonemasons were German, some French. They vied with one another as they hastened on with the work, the Germans on one side of the Church, and the French on the other. The building grew very quickly, and was completed in nine months and consecrated by Bishop Bartholomew. But because sad events are usually mixed with happy ones and the adverse with the favorable, a misfortune occurred on the very day of consecration. When the great crowd, which had gathered for the feast day, was pressing forward for the offertory into the area surrounding the altar, as was customary, the main altar moved and the stone broke and the consecration was voided, according to law, and all the work brought to nothing. Norbert was startled and saddened, fearing more the scandal of the weak than lacking trust in the work of God which does not happen without a reason. Nevertheless, he recouped his strength in the Lord of Consolation. He secretly arranged with the bishop a day for the rededication of the church, the Octave day of St. Martin. And so it happened. For this reason, as long as he lived, Norbert claimed that another dedication would have to be carried out at a future time. Afterward, Norbert, according to his practice, went out to preach. During his absence the ancient enemy laid many snares for the confreres who remained at Prémontré. Satan presented himself, along with his companions, to some of the confreres in broad daylight as an armed band, in the guise of those whom they had left behind in the world as mortal enemies. But they were terrified by the crash of arms and neighing of horses and fought back in whatever manner they could. Taking up clubs and rocks they fled; they also hastened to resist with their arms wrapped in their tunics or whatever was at hand. The fight was so bitter and so strange that they thought they were throwing weapons and weapons were being thrown at them; that they struck and were struck; were wounding and were wounded; were killing and were killed. when many other confreres came running toward them, reproving them for acting like madmen, they said: "Don't you see that we are oppressed by our enemy and, almost cut to pieces, that we are dying to our everlasting shame?" Then the confreres realized that these men had been deceived by an attack of demons. They sprinkled holy water, made the sign of the cross and, as the crowd of malignant spirits took to flight, the others pursued them, running swiftly as though the enemy were conquered and put to flight. They shouted after them loudly: "Hey, hey! Come back and resist, otherwise you will die a most shameful death if you ever dare to approach again." Later some of these confreres, coming to their senses and realizing that they had been deceived, henceforth persevered courageously. And they were victorious. But others, not able to bear the ignominy of such derision, went away struck by the sting of the demon's tail. The demon advanced against the same confreres with another type of deceit. Certain ones, whom he once used as the instruments of his will, he filled with such fraud, that those who previously could scarcely read anything in a book, now were saying marvelous things regarding books and prophesying great and wonderous things about the future. One of them asserted that he knew the prophecy of Daniel. He spoke, with the assistance of the Liar, about the passage where the prophet writes about four and seven and ten horns and about kings and the Antichrist. He drew the attention of some rather simple souls and, if it could have been done, would have even led into error that man of God, Simon, the venerable abbot of St. Nicholas. His arrogance had even grown to the degree that he presumed to give a sermon in chapter to those in attendance. He began with the words: "Be bold in war and fight with the ancient serpent;" but at the conclusion, "and you will receive an eternal kingdom," he was not able to continue. Meanwhile a cleric, who was an instrument of this evil work, was suddenly seized by an infirmity. He, who before spoke only about visible things, now presumed to lift his voice to heaven to speak of the invisible and ineffable. The confreres ran to anoint him and to hear what he was saying. He claimed great things about himself, but even greater things about those around him. He claimed about himself: that he, that very evening, would either be with the angels in heaven or would be standing healthy with the rest of the confreres in choir. But about the others, as though auguring or prophesying, he said: "When I was recently in ecstasy, I saw one man called to eternity; another one was placed on a throne of happiness, still another one's couch was set with the same joy; this one a future bishop; another a rector and master of many religious; this one to persevere in his good intention; that other one, failing, will depart." After saying this he behaved as though about to breathe his last. Then, after the space of an hour, he heard the call for vespers; he suddenly arose and, walking swiftly entered the choir with the others. When those present saw this they realized with shame that they had been fooled. The evil enemy likewise stirred up another confrere. Like the one concerning the prophecy of Daniel, this one professed that he knew about John's Apocalypse and how to probe the secrets of heaven. The prior was notified of this where he was working and through him, the convent. They returned in order to hear what these new events were. The man, whose name was Reinald, was sitting there flushed like one drunk. Another, whose name was Burchard, was sitting there weeping inconsolably. When he was asked the cause of such great grief he said: "My good brothers, look, my rival here intended my death and should you check his bed the instrument of my death will be found." There was a search and under each man's bed were found signs of hatred, namely a knife of some length and a large club. When these things were brought into the convent the prior said to them: "Brothers - would that you were brothers! - The disciples of our Lord Jesus Christ, who were instructed and illumined by the Holy Spirit lacked envy and hatred. For the Holy Spirit is the spirit of concord, not discord; the spirit of peace, not of dissension. It is now clear from which source you have drawn evil and not good, bitter and not sweet. Hence in the name of the Lord we impose silence on you, for we shall not hear you until our Father Norbert returns." Thus the confreres were cautioned against this and other such things. Some time later Satan seized upon a young man, the son of a lay brother, and began to torment him wickedly. The confreres, amazed and wondering at the assaults and their frequency, tied and locked up the possessed man until they could consult. In the silence of the night when the prior wanted to go to him, although the doors were still closed, the demon within began to shout in a loud voice: "Now he will come in to me, now he will come in to me. Here he comes. Here comes the master with the patched tunic. Let him be cursed! Lock the door, lock it as quickly as possible lest he approach me." The prior did not stop but, knocking on the door, entered and, standing before him, asked: "What are you saying?" He answered "Are you asking me what I am saying or who am I who speak? I will tell you neither. Surely you are not the master of this man or his protector or a teacher of the others? Go away," he said, "go away as quickly as possible, lest you depart shamefully injured by me." The prior was certain that this was an evil spirit and that he had very frequently come to deceive, but now to destroy. He said: "I command you through Jesus Christ, the Son of God, who on the cross overcame the snares and power by which you unjustly and fraudulently held man captive. Christ rightly took that power back, so that you may not presume to hide who you are." The devil responded: "Surely you do force me thus?" The prior answered: "Not I; He forces you who at another time conquered you, as I've said." And the demon shouting out said: "Woe is me! What shall I do? I am the one who was in the girl at Nivelles in the presence of your master Norbert, the white dog. Cursed be the hour in which he was born!" At these words the prior called the confreres together. Humbly they undertook corporal discipline and gave themselves over to fasting and prayer. Next they approached the demon with holy water. Therefore he began to growl and shout out noisily: "Let them come to this battle for we are many and we will crush them as grains are crushed by a millstone and we will completely destroy them." The prior responded: "You will do so only if you have received the power". The devil said, with hands outstretched towards him: "Do you think you are their master?" And with fingers extended toward their cross, he continued: "He is the master, not you. For you we do nothing, but He is the one by whom I am tormented." For the demons acknowledge and fear our Lord Jesus Christ crucified. The Jews and false Christians do not recognize Him but rather curse and laugh at Him. Finally the man in whom the evil spirit resided was freed. But although he could scarcely be controlled by many, a young cleric of the community, humbly bold yet truly obedient, said: "Command me through obedience and I will hold him not with my own hands but with the hands and shackles of obedience." When he had been given the command and the others had departed, he alone held the possessed man and led him, trembling at the very sight of him, to the holy water. He was placed in the holy water, while the exorcisms and gospels were read. Kneeling, the confreres prayed and cried aloud, while imposing on themselves various physical disciplines. Finally, after the man's body had been excessively tormented, the demon appeared sitting on the man's tongue like a grain of very black lentil. With open mouth and tongue stretched out, he showed himself to everyone standing there and said: "Look at me! I will not leave today for any of you." To which the prior's response was: "You are a liar from the beginning and no one should ever believe in you." Shortly thereafter the devil left, leaving an intolerably foul stench. Freed of its tormentor, the body immediately collapsed onto its sickbed. Only after a long rest did the man barely recover from his illness. Now at that time a confrere of commendable holiness was stationed at the gate to give alms and welcome guests with a prayer. One night while he was lying on his bed, which for everyone consisted of fern, Satan came to him. He was unable to sleep and Satan was roaring and sometimes grunting and rolling the fern around the confrere's feet. This happened three nights in a row. On the advice of the prior, when Satan came on that third night, the confrere said: "Wretched and most miserable one! You were the Light Bearer. You rose in the morning, dwelt in the delights of Paradise but, when this was not sufficient and you said 'I shall place my throne in the North, I shall be like the Most High', you lost what you were, exchanging darkness for light, misery for happiness, choosing the stench of pigs for a place of delights. A worthy and suitable exchange! There is no place for you here. Be like the pigs rolling yourself in the stench of the sewers awaiting the time of the judgement of the dead in places that stink." The tempter departed in confusion, and did not approach this confrere again in any visible form. The evil spirit is confounded and shamed when the delights which he lost are cast up to him. He panics and trembles when the threats and terrors of the coming judgement are mentioned. Hence the custom of the Holy Church has developed that the concluding words of all exorcisms are: "I exorcise you through Him who will come to judge the living and the dead and the world by fire." Therefore when the malicious enemy had harassed the confreres many times over, and found no place for deception among the simple, he crossed over with no difficulty to Maastricht where Father Norbert was. Satan seized upon a man who was the steward of a prince. Just then an annual celebration was taking place in the town and the priest of God, Norbert, celebrated Mass in the principal church there for a great crowd of people. The demoniac, growling horribly, was scarcely able to be held in control. After the celebration of the Mass he was brought to Norbert with much encouragement from the people who were present. Still clothed in the sacred vestments and, even more, girded with the strength of the Holy Spirit, Norbert approached to do battle with this most troublesome enemy. Some of the confreres asked him to spare his own health since it was now evening and they said this was a chance incident and that not all cases could be helped. He was disturbed by this and sternly rejected their proposal saying: "You are not aware, brothers, that through the envy of the devil death has entered the world. Death has continued in the world and has no intention of leaving. Indeed Satan inflicts himself on the world so frequently and in such a troublesome way that I grow angry. He makes the Word of God, which is ministered through me, grow worthless in the hearts of those who hear it. Although he is clearly unable to do so, through his innate arrogance, he secretly strives to take this Word away from those who have received it. Haven't you heard the words of the Lord, Who says that "the devil comes to take the seed of the Word of God from their hearts?" After he said this the possessed man was placed before the altar and Norbert began the exorcism compelling the demon to leave. When the priest had placed the blessed salt on his mouth, the man lunged forward and spat in his face, saying: "You have suggested that I be placed in water and beaten with harsh whips almost to the point of death. Your efforts are in vain. Your whips do not harm me, your threats do not frighten me, death does not torture nor do the chains of death bind me." The suggestion had indeed been made that he be placed in holy water although the raging man didn't hear it. When therefore the clergy and people were standing around - some out of curiosity, some out of piety - the evil demon, through the mouth of the possessed man, began to reveal the reprobate lives of many, recalling their adultery and fornication. Whatever had not been hidden by confusion was now revealed by his malicious mouth. Hearing this, everyone began to flee this way and that, only a few remaining with Father Norbert. However, as the day came to a close, those who were present, weary from the fasting and vigils of the preceding night, forced Norbert to go to his residence in order to refresh his weary body with food and sleep. While Norbert sat at dinner with his confreres and some guests, it was announced that the sick man was sitting quietly and unbound before the altar and was asking pardon for the curses which he dishonorably uttered. They gave thanks to God, for truly that night and the next day he appeared to be cured. Now there was a mortal hatred among the citizens of that same town. Father Norbert had spent the entire next day settling and putting this feud to rest, and by the grace of God he brought complete peace among them. However, the devil who had been expelled from their hearts, not willing to depart, returned to the same wretched man who seemed to be cured. Immediately the man began to howl and rage. Therefore, when the priest of God had returned to the church, those standing there said: "Are you not aware that this possessed man of yesterday is raging again? Unless he is cured as quickly as possible he will perish, consumed by his own fury," The man of God responded: "For the present he will not be able to be freed from his tormentor because this is happening to him due to his sins" - he bore the office of steward of an estate - "and he was given over to his tormentor deservedly. Leave him alone now! After the devil vexes him for some days he will be healed, once satisfaction has been shown." And that is what happened. For three days he was bitterly tormented. Afterwards he was freed from the devil by God's mercy and, in control of his mind, he returned home unharmed. At that time, when Norbert's reputation was spreading, Godfrey, a very powerful Count of Westphalia, was touched by the fear of God. He approached Norbert and shared with him his intent to give up all his property and embrace voluntary poverty. He was wealthy, powerful in arms, well endowed with estates, servants and handmaids. Renouncing all of these things he handed them over to the man of God to be disposed of, with this stipulation, that he turn the fortress of Cappenberg into a religious house and consecrate it to the service of God, so that, through the mercy of God, virtue might spring up where vice had reigned. His wife and younger brother, his men and their household ministers as well as Count Frederick, his wife's father, all spoke against this action of his. Frederick said that the donation which he was making was for the most part from his daughters dowry. Although the controversy over this matter was long and complex, finally by the grace of God his wife gave her consent and his brother also decided to change his life. So it happened that from their possessions three churches were set up, namely Cappenberg, Ilbenstadt, and Varlar. 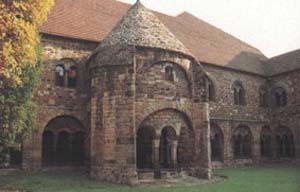 These houses were then staffed with confreres where religious life worthy of God thrives even to the present time. 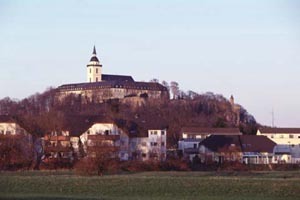 Because the fortress of Cappenberg held control of Westphalia, Count Frederick, the father of Godfrey's wife, partly to indulge his ambition, alleged that this was his daughter's dowry, and threatened the confreres with death unless they departed as quickly as possible. He came there with his retinue several times, threatening that if he should find Father Norbert he would hang him up with his donkey so that he could see on the scale which of them was the heavier. Bishops and other princes who were present spoke against such boastful speech and threatened him with the wrath of God. 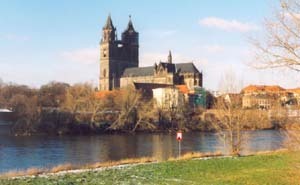 By now, Father Norbert was held in high esteem by all in the Rhine area and they objected to anyone speaking ill of him. The confreres of Cappenberg, in their difficulty, sent to the man of God, asking his help and, at the same time, informing him of the boastful words of this proud man. When he received the message, he gathered all his strength of faith and hope in Him who said "Have confidence, I have overcome the world", and publicly announced that he, with his donkey, was going to enter that territory and place himself in the Count's power. What more? Although the journey was long, nevertheless he did not change his mind. 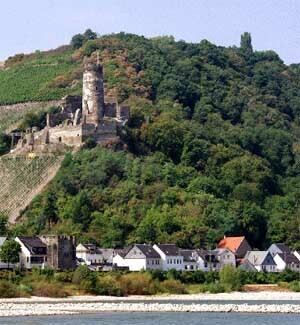 Crossing the Rhine, unarmed and powerless, he entered the territory of Count Frederick. While Norbert stayed there divine vengeance came upon the Count. While he sat at dinner, his stomach burst open and brought an end to his evil life. With his death peace returned to the Church. After Father Norbert had returned to France, a very noble French prince, Count Theobald, approached him to ask advice about his salvation. Norbert had heard that this Count was very generous in giving alms, and in building churches and monasteries; he had heard that he was a father of orphans, spouse of widows, and steward of the poor and infirm. Therefore he did not presume to change this man's holy way of life, but gave the advice to continue his good work and to beget an heir through marriage who would inherit these vast domains with the blessing of his forefathers. The man of God used much discretion in his advice. He wanted the above mentioned prince of Westphalia, who was a plunderer of others' goods, to renounce his possessions. However he persuaded this count of France, who supported the needy with his goods, to possess all as though having nothing. At that time the man of God arranged to set out for Rome. The legates of Count Theobald were his companions on this journey and went with him as far as Regensburg. The brother of the bishop of that city was Engelbert, a powerful and noble margrave. It was his marriageable daughter whom they sought and obtained as a bride for their master Theobald. They then returned to their master to announce the good news. 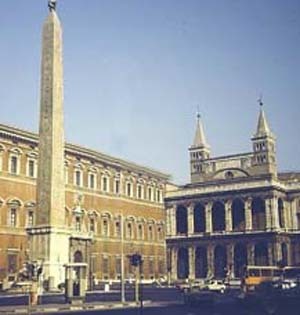 Norbert, however, having resumed his journey, arrived in Rome where he was honorably received by Pope Honorius of happy memory. Norbert obtained from him whatever he reasonably requested. 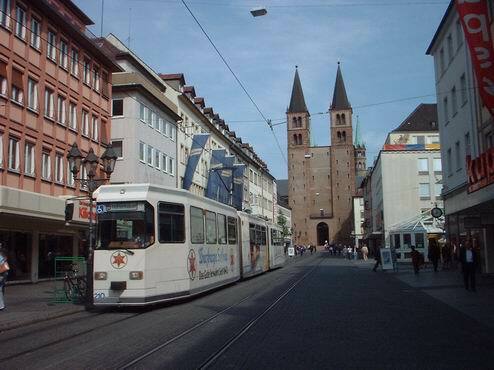 When his business was finished he set out on his return trip and came to the city of Würzburg. On this journey both he and some of his companions clearly heard that he would be the future bishop of Magdeburg. While he was celebrating Mass in the Cathedral of Würzburg on Easter Sunday before a large gathering of people, a blind woman, whom everyone knew, approached him as he was consuming the Body and Blood of the Lord. He breathed on her eyes just after he consumed the Lord's Blood and soon after she regained her sight. Hence all the people who were present extolled the greatness of God in a loud voice. Some of the prominent citizens of the city were so touched by this that they gave themselves and their possessions to God through Norbert. Through their generosity a church called "Cell" was built near the city and is famous for its divine worship even to the present time. But the man of God, along with his companions, recalled the voice which he had heard on his return from Rome. Fearing that he would be elected bishop there, since the see was vacant, he departed quickly and in secret. 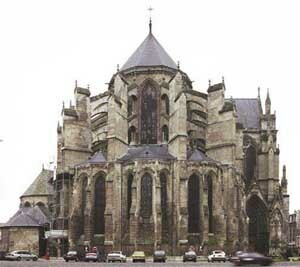 After he returned to Prémontré, he arranged for the establishment of the Church of Blessed Martin which is in the suburbs of Laon, and the Church of Vivieres which is in the district of Saison, placing some of his confreres there. On the very day on which the confreres of Norbert had arrived at Vivieres, the ancient enemy, black and in horrid attire, appeared to a farmer who was cultivating the fields. He said: "Why are you working? What are you doing? Be subject to me and I will make you rich." Thinking him to be a monk, the man responded: "Keep what is yours; we have Norbert. He will enrich us both in soul and in body." Hearing this, the demon breathed on him as though offended and then vanished, saying "Norbrec, Norbret! ", as if he were tormented by the name. The farmer, however, dropped his hoe and ran screaming madly through the fields. His neighbors who were doing similar work in the same field came running. They saw that he was beside himself; they took hold of him and led him bound to the Church of Vivieres. In the evening Norbert arrived there with Anscolf, the Archdeacon of Soisson, in whose jurisdiction the church lay, so that according to the local custom he might officially assign the place to the man of God. This was done. Meanwhile the demon was cruelly tormenting the aforementioned farmer and when asked his name he said he was Olybrius, who had tormented blessed Margaret. Father Norbert, at the request of many approached the possessed man and sprinkled him with holy water. Then rubbing his gums with blessed salt and washing them with holy water he ordered him to take no food for nine continuous days unless it was seasoned with blessed salt and holy water. Having done this the man was healed and returned home. In the morning he came to church and, thankful, told the people the details of what had happened to him in the field. There arose at that time a most destructive heresy at Antwerp, which was a very large and populous city. A certain heretic, a seducer by the name of Tanchelm, who was remarkably shrewd and cunning, came there and found an opportunity for his false teaching. He was an evil man, an enemy of the Christian faith and of all religion to such a degree that he declared that obedience to bishops and priests was not necessary and denied that the reception of the Most Holy Body and Blood of Our Lord Jesus Christ was a benefit to eternal salvation. He led many people of that region astray. As a result, they believed everything he said. About three thousand armed men were in his following and there was neither duke nor prince who would encounter or resist him. He wore gilded clothing and his curled hair glittered with gold and many ornaments. With lavish banquets and persuasive words he won the good favor of his listeners. Strange and astonishing! They drank his bath water and carried it away, preserving it like a relic. They also willingly involved themselves in many other vile and detestable activities so that even after the heretic's death it was not possible to root out this destructive evil. There was in this city a community of twelve clerics who, forced by the circumstances of the error, handed over their church along with some of its revenue to Father Norbert and his confreres. This was done through the agency of the bishop. They hoped that through the merits of Father Norbert and his confreres the fury of this prolific plague might be removed and, with the darkness of ignorance dispelled, the light of truth might be restored. Norbert accepted this church and the aforementioned clerics built another church for themselves in the same city. Both churches remain to this day dedicated to the service of God. And thus it happened that the people who were falsely led astray by that depraved seducer were brought back to the path of truth and justice through the work of the pious preacher Norbert and his confreres. One thing further. During the winter when the man of God was at Prémontré he took the opportunity at night to speak a word of exhortation to the confreres. Some were thirsty and water was brought from the spring. When Norbert claimed that the water was not clean, those who had brought it protested that the vessel had been washed and that they had brought the purest of water. He insisted, however, that no one drink the water. After lighting a lamp, the confreres looked carefully at the bottom of the vessel and found a large repulsive worm crawling in the jar. They were astounded because it was winter, when worms of this sort were not usually found, and because the spring from which they recalled drawing the water was very clean, as was the vessel. They now burst forth in praise of God because they had been rescued by Father Norbert from the snares of the enemy. In various ways the ancient enemy frequently tried to deceive the confreres at Prémontré. Even when they absented themselves to take care of the needs of nature, he appeared to them in frightful images and threatened them with various fantasies. One of them, however, gathering his courage and strength of mind, said to himself: "How long shall I endure the falsehood and fantasies of this most troublesome enemy?" And getting up he rushed at the devil and sent him flying. Thus from that time on he remained immune from such illusions. The malicious enemy appeared to another confrere also as he was tending to his private needs and kept him there senseless, from the beginning to the end of Matins. Finally, however, the constancy of the confrere won out over the importunings of the devil, for, making the sign of the cross, he leapt through the doorway which seemed occupied by the demon. When he found no one opposing him he realized that this had been an empty demonic illusion, and thus, gaining a spirit of freedom, he henceforth feared nothing of this sort. One night the devil also came to terrify Father Norbert as he was intent on prayer in the church. The devil stood there in the form of a frightful bear striking fear in him with its teeth and claws. The man of God was somewhat frightened by the unexpected appearance but soon came to himself and recognized the snares of his persecutor. After a while he regained his courage in prayer and said: "What do you want, bloody beast? Your claws are without substance, your frightful teeth are air, and your hairy pelt empty smoke and vapor passing away like the shadow which vanishes with the sun. You were formed in the image and likeness of God and, although you were light, by your pride you merited the darkness. Depart now, I command you, because there is nothing in common between Christ and Belial, between light and darkness, between the faithful and the unfaithful. Depart quickly! You know you can harm no one without permission." The Liar then disappeared, unable to endure the truth. Now the time had come when the above mentioned Count Theobald along with his friends was, at the set time and place, to meet his bride and her father and the gathering of her relatives. Father Norbert had also been invited. But the bride, detained by illness, did not meet him and this gave cause for suspicion that perhaps some regret or deception intervened in this arrangement. Hence, Father Norbert was asked to continue on and carefully investigate the cause of this delay. Norbert agreed to their request and set out to bring to a close the concern of this marriage which he had undertaken to arrange. As a farewell to his confreres at Prémontré, he sent them a little money which he had received, so that they might add one hundred twenty poor, under his name, to the number of five hundred poor whom he fed at the time of famine, and that they might care for them with fraternal charity. He had no hope of returning to remain with them any longer. Hence he left them this memorial of his name, following in this the example of the True Master who, when he had loved those who were his, loved them to the end. 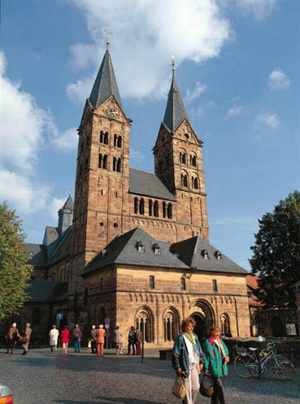 In the year of the Lord's Incarnation 1125, the Archbishop of Magdeburg, the metropolitan of Saxony, died. After his death the election of a future bishop was difficult since there were three eminent persons named as candidates. Because the electors were unwilling to withdraw from the candidates of their choice, the matter was brought to the hearing of the Emperor, the Most Serene Lord Lothair. There was with the emperor at that time Gerard, the Cardinal Legate of the Roman See, who after Pope Honorius governed the Catholic Church as Pope Lucius. It was on his advice, since the electors could not agree, that the emperor decided to appoint Norbert as Archbishop of Magdeburg, after taking counsel with Adelbert, Archbishop of Mainz, and Albero, the Primicerius of Metz. Norbert at that time had been at the court to preach the word of God. Therefore, after calling together the electors and after much discussion, the emperor himself appointed Norbert Archbishop. The aforementioned Cardinal Legate of the Apostolic See, on the authority of the pope, confirmed this sincere and commendable act of the emperor and immediately sent messengers after Norbert, who was preparing to depart. Amidst a great roar of acclamation he was presented to the prince, while all the leaders of the Church of Magdeburg cried out: "He is our choice for our father and bishop; we approve him as our shepherd." And although he protested against this as much as he could, compelled by those surrounding him, he was finally brought to his knees before the emperor and forced to accept the crosier which was placed in his hands. Meanwhile the cardinal addressed him in these words: "By the authority of Almighty God and the Blessed Apostles Peter and Paul and the Lord Pope Honorius, I order you not to speak against the call of God in any way. Rather, as a faithful and prudent servant dutifully administer the "money" of the word of God which you have received for distribution so that when the Lord comes to reckon with His servants to whom He has given money for their use you might merit to hear from him: "Well done, good and faithful servant, because you were faithful over a few things, I shall place you over many. Enter into the joy of your Lord." Finally, yielding to numerous arguments and the apostolic authority, he accepted the yoke of the Lord, not without much weeping; and thus dismissed by the emperor, he set out for Saxony to the place destined for him. At his approach to the city, the people gathered. All gave thanks that they had deserved to receive a man of holy reputation as the shepherd of their souls. Gazing at the City of Magdeburg to which he was being led, he entered barefoot. After he was received in the church he entered the palace accompanied by many people. However, since he wore a shabby cloak, he was not recognized and suffered rejection at the hands of the doorkeeper. But when the doorkeeper was reprimanded by others, Father Norbert, smiling, said: "Don't be afraid, you know me better and see me with a clearer eye than those who force me to this palace to which I, poor and simple, ought not to be raised. After he was consecrated bishop he began to be a faithful steward of his household. He called together the administrators of the diocesan property and undertook a reckoning of the income of the diocese. This was found to be so modest that it could scarcely cover the expenses for four months. 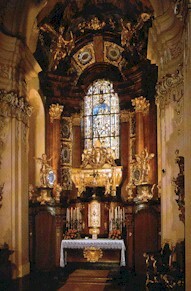 Although the church at Magdeburg had been established and raised up by imperial power and endowed and expanded by much generosity, nevertheless it had been greatly reduced by the negligences and extravagances of the archbishops. 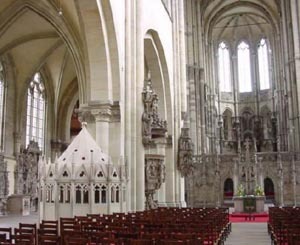 To restore it, Norbert the Archbishop, encouraged by the will of God, took back the possessions of the Church appropriated by the hands of the violent. By so doing, he afforded them the opportunity to malign him. He became hateful to everyone who at first acclaimed him with praise. But he did not hesitate to suffer insult for the name of the Lord. Hence by condemning, both when favorable and unfavorable, by rebuking, by entreating, he tried to renew the face of his church both by spiritual and physical increments. Among the many things promptly done by him, he obtained the Church of the Blessed Mother of God and Ever Virgin Mary from the emperor and the cathedral chapter, as well as from the canons of that church. He placed the confreres of his Order in this church as he had so long desired. Here, by the grace of the Holy Spirit, they devoutly administer the divine services to this very day. In response to Norbert's good work, however, the indignation of his rivals was stirred up. On the very solemn day of the Lord's Supper, while he was receiving penitents for confession, there stood at the door of the house a man clothed in penitential garments. He asked the porter to be admitted for confession. The porter indicated this to the man of God, who said: "Don't let him in." When therefore he persisted in knocking, the others stood back and he was finally admitted. The man of God looked at him carefully from a distance and said, "Do not approach, but stand there and do not move." Norbert called the palace servants who were outside and ordered them to remove the young man's garment. When he was stripped there appeared secured to his side a sharp knife about a foot and a half in length. When asked why he had come armed like that, trembling and stunned and fearing death, he fell at Norbert's feet and confessed that he had been sent to kill him. After hearing the names of those who had hired him to commit the crime, all were amazed that household members and secretaries were found to be at the heart of this betrayal, men at whose hands official matters were handled. This just man, however, calmly responded that it was no wonder that the ancient enemy was preparing these snares for him, since on this same most sacred night he persuaded the Jews to proceed to the death of our Lord Jesus Christ. He was happy that he merited to be a sharer of the Lord's Passion, especially on that day on which mercy is given to those without hope, pardon to sinners and life to the dead. At another time a cleric of his household attempted at night to strike him with a knife as he was leaving with his clerics for the celebration of Matins. But by mistake he struck another of the clerics ripping his garment. And when the man shouted that he was wounded, the attacker, knowing by the sound of the voice that it was not the archbishop, said: "I did not think it was you but he whom I was planning to kill." The Archbishop had gone ahead, mixed in among the others, fearing just such an event as though having advanced knowledge of the future. Therefore when others were pursuing the fleeing attacker to capture him, the man of God said: "Let him flee. You should not render evil for evil. He did what he could and what God permitted." In the midst of all these events Father Norbert had not forgotten his first foundation in the Church at Prémontré. Lest perhaps the confreres, whom he gathered there, be in danger without a shepherd, he sent messengers there to grant them free election of a shepherd. He made a recommendation, suggesting a person who was suitable, and of proven religious value, and this is the one whom the confreres unanimously - a unanimity pleasing to God - agreed upon. The one who was elected was at the same time staying with Father Norbert. On the day on which the confreres elected him, he learned of his election through a vision in the night. He claimed that in the vision he stood with Father Norbert before Our Lord Jesus Christ, and that he was received by the right hand of the Savior from the hand of Norbert, who said: "O Lord, to Your Most Holy Majesty I present this man whom You entrusted to me." When the news regarding the unanimous choice of the confreres arrived, Norbert addressed the one elected in the presence of the confreres who were with him, saying: "Through election by the confreres you will succeed me in the house of our poverty. Go therefore in the name of the Lord, for the hand of the Lord will be with you until the end." After receiving Norbert's blessing, he departed taking two confreres with him, one of whom was appointed abbot in Antwerp, the other in the Church at Floreffe. He himself, however, went on to Prémontré and became a renounced abbot of that church. Soon he appointed abbots from among his confreres for the Churches at Laon and Vivieres and for the one called Bonne-Esperance. He determined to come together annually with these abbots in a set place for the reparation of any decline of the Order, for eradicating excesses and for the healthy restoration of anything necessary. From then on the confreres of that Order, which the venerable Father Norbert established, increased throughout the world even to the present day. Around this same time Pope Honorius, of blessed memory, passed away. Innocent succeeded him by canonical election but was unable to take possession of the Roman See because of the intrusion of Pierleoni and the sedition of Pierleoni's relatives. Innocent left and went to France where he was honorably and fittingly received. There he presided at the Council of Rheims where archbishops and bishops and a multitude of prelates and faithful of Christ gathered from diverse lands. Here the interloper Pierleoni was excommunicated and the election of Innocent confirmed. Archbishop Norbert was present. Besides the many concerns of the universal church, he consulted regarding the private needs of his own church and obtained the confirmation of the Apostolic See regarding many useful privileges. When his affairs were in order he returned home. On his return, however, he found an unexpected situation which was disturbing. Something happened in the cathedral which according to the authority of the canons seemed to require reconsecration. The elders of the city spoke against this, claiming that the consecration ought not to be repeated since it had been celebrated on the authority of many kings and bishops. Norbert on the contrary responded that he would never celebrate the divine mysteries there unless the anathema was removed from the church. Soon he announced publicly the outcome of the matter, pointing out that he was bound to do that which the custom of the Holy Fathers decreed in cases of this sort. Therefore on the following night Norbert and two other bishops, along with the cathedral provost and many of his clergy, clothed in sacred vestments entered the church and, as is the practice, performed the office of consecration with sincere devotion. When the office was completed, however, while they were still in their sacred vestments, much shouting and tumult among the people was heard outside. Indeed the whole city was in an uproar because of the rumor that the Archbishop had smashed the altars, had opened the sanctuary, had broken up the tombs and reliquaries and laid them aside for himself, and under the darkness of this night, had decided to flee with all of these, as well as the treasures of the church. Hearing the clamor of the populace, those who were with the man of God were terrified. He was undaunted and wanted to go out to the people but his companions kept him from doing this. they said that an uprising could not easily be settled at night. They forced him to climb into a fortification which in former times had been built by the Emperor Otto for a church tower. The church itself was never finished because of Otto's death. There Norbert and those who were with him sat down, still robed in the sacred vestments, and awaited death. Once settled in the tower they celebrated the solemnity of Matins in honor of the Blessed Paul whose feast was being observed. They sang the praises of God while the tumult of the people, who kept them under siege, increased against them. At this point, some of the confreres resolutely awaited the outcome of the situation, while others faltered and, groaning, said: "Oh, why did we follow this man here to die with him in our sins?" The holy man consoled them as much as he was able: "Don't be frightened, my dear brothers. What we have endured is of God; what we are enduring is of God. When some good work is assailed by God's enemies it is by His permission." Saying this he prayed more fervently for them that they might not weaken, and from their lack of prayer his own devotion increased. He later claimed that he feared not so much death as that his confreres might give up from despair. The hostile crowd continued to gather throughout the whole night, but the priest of God and those gathered with him increased their prayer. 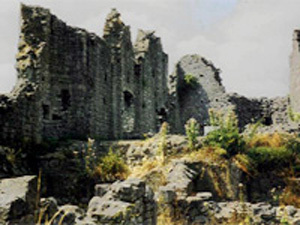 In the morning, some men made an advance on the tower, others attacked the Archbishop and his clerics with arrows. Then unexpectedly certain men who were said to have sworn to kill Norbert boldly climbed to the top of the tower. When the man of God saw them attacking with drawn swords, he stepped forward lest they kill others in their rage. He said: "You are seeking one man. I am here. Spare these who have not deserved the sentence of death." When they saw him, still clothed in his purple pontifical vestments, they were suddenly struck by the grace of God and, falling at his feet, sought and received pardon. Once his adversaries, they now became his defenders. Others, however, quickly followed and, assuming the Archbishop was beheaded, tried to kill one of his soldiers who was in their way. They drove a sword into his neck all the way to his throat and, thinking him dead, left him half alive. When the man of God saw this, leaping into the midst of the crowd he put himself in death's way rather than have anyone die while he remained alive. But when the one who had struck down the soldier saw him, full of fury, he boldly struck at the shoulder of the Archbishop with his still bloody sword. The sword glanced off but did not inflict a wound; nevertheless the blood on the sword spattered the fringes of the episcopal miter. Thereafter the stains from the blood were always visible. While this was taking place, some, who did not seem to be participants of this uprising, placed in their midst the relics of the saints which were brought from the churches. They said that it was a disgrace that the shepherd was attacked by his flock. They said this feigning a false kindness. They too were trying to force him, while he was in this predicament, to remove from the Church of the Blessed Mary his confreres whom, as was stated above, he had stationed there. But he absolutely refused, claiming that, as long as he lived, this act, which they regretted had been confirmed by imperial power and apostolic authority, would not be counteracted by them. While they awaited the outcome of this event and the end of such tumult, the Count of the City arrived. He was returning from a journey and, unaware of the uprising, came upon the rioters. Separating them one from another, he set a day on which everyone who had a just complaint against the Archbishop might come and receive justice. At the orders of the judge they departed. But the priest of God entered the cathedral, over which the riot had taken place, to say Mass and render unbounded thanks to God. When he approached the altar he said to those gathered around: "Look, everything which had been reported broken and stolen is whole and safe." Then he celebrated Mass there but read the epistle and gospel himself as all his ministers, exhausted from weariness and fear, had left. When Mass was finished he entered the palace happy, elated and thankful that the Lord had delivered him from such tribulation. The uproar of the evil doers still did not cease. They complained that they had been deceived because the venerable priest had evaded their trap. So they made a pact among themselves that on an appointed day they should all come together drunk so that if they did anything wrong it would be attributed to drunkenness rather than to premeditation. And they agreed that if anyone went against this decision his home would be confiscated. When this was relayed to the princes of the territory, who seemed to care for the Archbishop because they knew he was a just and holy man, they advised him to leave for a while. He refused and, rejoicing, awaited the martyr's palm. The day agreed upon arrived and when the signal was given the citizenry began to make a lot of noise and shouting. When the Archbishop asked what this was all about, he was told that a large mob was trying to expel his confreres from the Church of the Blessed Mary. But he smiled and said: "It is not to be, because a foundation which the Heavenly Father has planted cannot be uprooted." Then as the people began to gather, horses were prepared and he was forced to leave. 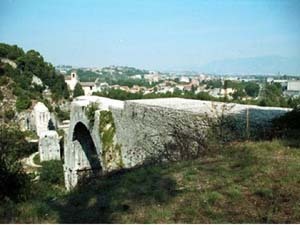 He went to the Abbey of Saint John the Baptist which was located in the suburbs of the city. There he spent some time putting his affairs in order. He then went to Gevekenstein Castle to rest from all this turmoil. When he found this castle closed to him - for the enemy arriving ahead of him had seized the fortification - he went to a church of canons which was nearby, where he remained for several days praying that God would direct his way in accord with His will. While he remained there in a humble and saddened frame of mind, peace was restored with the help of god and the mediation of those who were loyal to him. His adversaries gathered contritely and were humbled before him. He received them kindly and demanded only one thing of them, that they not hesitate to be reconciled to his wounded soldier. This they accepted most willingly and repaired the soldier's ruined house and gave him forty silver marks in compensation for the wound he received. After this the fortress, which had previously been closed at his arrival, was opened to him and he was received there with honor, surrounded by a band of many nobles. All the people praised God for the constancy of such a Bishop who remained undefeated, secure in body and spirit, in spite of the evident danger of death. These events took place in the third year of his archepiscopy. After this he ruled for five years, and from day to day gave honor to the ministry entrusted to him by God, advancing in all religion and virtue, preserving the unity of the Holy Church and resisting and protesting against those who disturbed it and against all schismatics, embracing the good, giving counsel to the desolate, supporting the poor and orphans and widows, fostering and helping to spread religious orders, while setting an example of religious life, presenting himself affably both to the lesser and the greater according as the dignity of his office could bear. Not unmindful of the divine generosity and grace, he daily offered to the Lord his God an upright conscience with a pleasant and charming personality. There was still a very serious schism at that time. 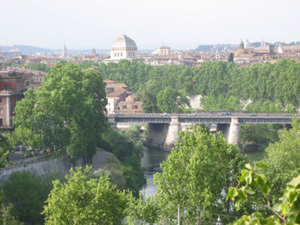 The Catholic Pope Innocent worked here and there among the Catholics and the schismatic Pierleoni occupied the See of Rome with the help of his relatives and supporters, committing many crimes in the city against the laws and statutes of the Fathers. Because of this, the Emperor Lothair, after holding council with the princes of the empire, arranged an expedition to Italy in order to oust the sacrilegious Pierleoni with the material sword inasmuch as he resisted the spiritual sword. Father Norbert joined this expedition, obedient to the command of Pope Innocent and at the call of the emperor. Though frail in body he was nevertheless prompt and resolute in spirit. Afterwards it was clear how necessary and useful he was for the Church while on this expedition. 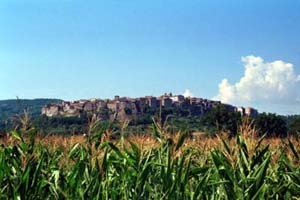 Now while the emperor halted with his army in a place which the inhabitants call "ad sanctum Valentinum", and Pope Innocent was staying at Viterbo, legates from Rome sent by Pierleoni approached the emperor. They tried in various ways -- by entreaty, by bribes, as well as by reasoning - to persuade the emperor to agree with him. When these attempts failed, since Father Norbert spoke against them, they demanded a hearing and appealed to a tribunal of justice. With this, they won over to their side the minds of some of the princes as well as the rest of the faithful to some degree. Hence Norbert, concerned for the peace and honor of the Catholic Church, hastened to Pope Innocent and explained what was happening in the camp. He advised him insistently not to put off providing for himself and his people. Although Norbert was told that it was not fitting for the Sovereign Pontiff to be subject to the judgement of man or be present at tribunals, Pope Innocent, freely and honorably looking to his own interest, put himself at the disposal of Prince Lothair, saying that he would allow himself to be permanently imprisoned if he did not present himself for examination by the royal tribunal at the place and time set for him. And so the deception of Pierleoni, who sought the papacy like a roaring lion, was brought to naught. Innocent gradually became more acceptable to all those with sound judgement. 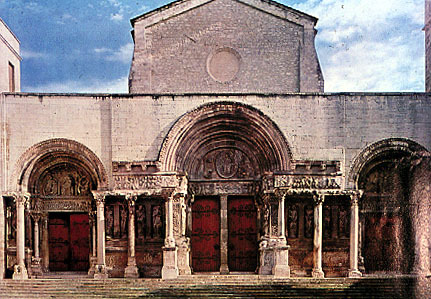 Next Lothair moved his army and advanced on Rome following the difficult circuit through Orte and Narni, encamping first on Mons Latronum, then boldly within the walls of the city on the Aventine close to Santa Sabina. Finally he placed Innocent on his throne in the Lateran Palace. Later when the day arrived on which Lothair was to be consecrated emperor by Pope Innocent, Rome was suddenly thrown into confusion and uproar, fearing that the solemn imposition of the imperial crown by Innocent would bring the inevitable deposition of Pierleoni. And so it was. From this time on Innocent began to grow and gain power, and Pierleoni's power grew weak and declined. Pope Innocent then, along with the cardinals and bishops and his entire clergy, solemnly welcomed Lothair as he entered with his forces and solemnly consecrated him emperor amid the cheers of all present. After his coronation, however, with little forethought the Emperor requested that the Pope grant him the right of investiture of the bishoprics, i.e., that the freedom of the churches be handed over to him for the honor of the empire and the firming up of the bond which he had pledged with the Pope. The Pope seemed inclined to grant this request. Since none of the many bishops present spoke out against this abuse, Archbishop Norbert stepped into their midst in the presence of the Emperor and his military and said: "Father, what are you doing? To whom are you exposing the sheep entrusted to you only to have them torn to pieces? Will you reduce to a maidservant the Church which was free when you received it? The Chair of Peter demands the deeds of Peter. I promised obedience to Peter and to you for the name of Christ, but if you do what is asked of you, I will speak against you in the face of the Church." Thus Father Norbert pleaded his case. And so the Emperor backed off from his improper request and the Pope from his illicit granting of it. This same emperor Lothair was a God-fearing man, an active leader of war, distinguished in arms, prudent in counsel, frightful to the enemies of God, an ally of justice, an enemy of injustice. His courage was known in Sicily, renowned in Saxony, and as long as he lived the Roman Empire which he governed remained firm with the help of God. He too loved the man of God Norbert in that he was often guided by his advice and through him was daily nourished by the word of God. One day a soldier in the Emperor's army was ill and troubled by an evil spirit. Tearfully the soldiers presented this man to the Pope to be cured. Objecting to their intrusion, the Pope went inside to his chambers and left the possessed man in the church to the care of Father Norbert and a few who were with him. Norbert took pity on him and said to his confreres: "Let us approach the Lord in a spirit of humility and contrition to see if perhaps He may deign to look upon the work of His hands in this poor man." He said this and immediately looked for a quiet place to pray. After Norbert gave way to tears and groans from noon until evening, he obtained the cure of the infirm man. In the twilight of the night, after many horrid words, the evil spirit left him. The man himself collapsed into the hands of those caring for him and fell asleep. After a little while he woke and got up healthy. The man of God urged him to go to confession, and, both for the remission of past sins and in thanksgiving, he ordered him to abstain for several days from sumptuous foods. He told him straight out that, if he should stray from this rule of abstinence, the same punishment which he just escaped would happen again. Thus cleansed and reconciled to God the formerly possessed man proceeded to Pisa with the man of God. There, he misused his freedom. Because he did not do what he should, he suffered what he didn't want to. While he was staying in Pisa, he was not on his guard but out of curiosity wandered around alone. He was suddenly seized and miserably tormented. Once again he was delivered by the grace of God through the ministry of the priest of God. After so many labors, physical strength began to forsake the man of God. Worn out by long and severe penitential austerity, his health declined both from the strain of the journey and from the corrupt condition of the air. Nevertheless he returned from Italy and was brought to his city of Magdeburg, but not without great difficulty. There he lay for four months and was overcome with great feebleness. Finally, after having administered his diocese wisely and faithfully for eight years, fully conscious and giving his blessing to those in attendance, he died in blessed peace. As Augustine said, one could not die badly who had lived well. It was the year of the Lord's Incarnation 1134, the Wednesday after Pentecost, the eighth day before the Ides of June, in the fifth year of Pope Innocent, in the ninth year of the reign of Lothair. 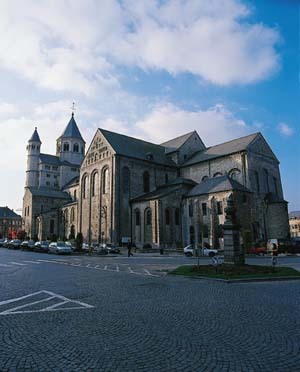 Now after the Bishop died, no little contention arose between the cathedral and the Church of Blessed Mary concerning the place of his burial. The Canons of the Cathedral claimed that it was worthy and just, because he had been the head of the churches of that city, that his bones should bring honor to the principal church, and there await the coming of the Sovereign Judge. There he held the title of the church even if he would have lived for a long time. The confreres of the Church of Blessed Mary, on the contrary, said that he had not only been the Archbishop but also a special father to them and their provost till the end. Therefore they ought to have his body, especially since devotion to him demanded that he be buried and rest among his confreres and sons whom he had begotten for God by the seed of the Word of God. To settle this argument a delegation was sent to the Emperor Lothair so that if he himself judged in this matter it would be considered settled. Meanwhile the body lay unburied and day by day was brought to the different monasteries of the city where vigils and those prayers which are due to the faithful departed were devoutly celebrated. Although the heat was intense, no odor of corruption was emitted by the body over so many days. The messengers who had been sent out returned eight days later and by command of the emperor the body was taken to the Church of Blessed Mary and buried before the altar of the Holy Cross. Some years later it was moved to the choir where it awaits the final day in the hope of a blessed resurrection desired greatly by every faith filled soul.